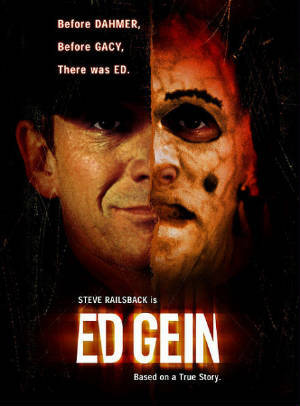 If you’re going to make a movie about a serial killer, "Ed Gein" is an excellent example of how to do it right. "Ed Gein" is the most accurate biopic about the strange case of the cannibal serial killer of Plainfield whose eerie life inspired the making of such classics as "Psycho", "The Texas Chainsaw Massacre" and "The Silence of the Lambs." Even though, no film will truly show us the behaviors Ed Gein engaged in because no one knows for certain all of the atrocities he committed, "Ed Gein" peels the curtain back and introduces us to the man behind the monster, his various psychopathologies, and his blood thirsty interpretations of his mother's obsessive preachings. The movie spends a great amount of time examining the odd method of childrearing practiced in the Gein household. His mother Augusta ( is a woman dedicated to bible thumping and character assassination. Ed (Steve Railsback) and his older brother Henry (Brian Evers) spend most of their childhood and a significant amount of their adulthood sitting around Augusta listening to her drone on and on about her favorite biblical passages. Her greatest hits consist of those parts of the holy writings promising to bring justice and vengeance down upon the wicked, and for Augusta Gein the whole world is packed to the rafters with wicked people. Women especially come in for special scorn from the bitter old lady, and she spends an inordinate amount of time warning her sons to avoid the "harlots" living in town. Her vitriol splashes on her husband too, an alcoholic largely reduced to surviving in a household you wouldn't wish on your worst enemy. Once Augusta Gein passes away, Ed feels the urge to honor her teachings by committing a series of atrocities involving grave robbing, defilement and -possibly - cannibalism. Gein's proclivity towards the bizarre soon escalates. Digging up corpses gives way to going out and procuring fresh bodies. Ed murders bar owner Mary Hogan (Sally Champlin) and drags her body back to his house for a whole new round of mayhem, an action fully justified in Gein's mind due to the woman's promiscuity. He later slays a local storeowner, a crime that is his undoing because of his own incompetence: he took the cash register and left a receipt book behind showing that he was the last customer to visit the store. The authorities discover a literal house of horrors when they enter the Gein farmhouse. "Ed Gein" covers many of the smaller details of the Gein case. The movie even shows us a scene involving the two young boys who would come over to the farmhouse in order to pal around with Ed. 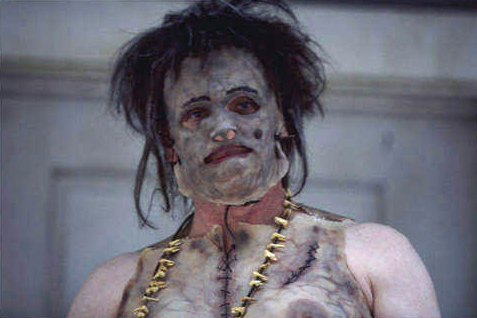 On a much grimmer note, a very short scene reveals in horrific detail how Gein would dress up in clothing made from human skin, bang on a drum, and dance around outside at night. As yucky as this last situation is, it's about as horrific as the film gets. There are a few other unnerving sights and sounds, but "Ed Gein" is remarkably restrained considering the subject matter. The best aspect of the film has little to do with the gore and everything to do with the acting. Railsback gives an unforgettable performance in the role, capturing perfectly what all the written accounts of the man claimed: that Ed Gein often seemed like a child captured in a man's body. Carrie Snodgrass comes in for special mention, too. The late actress makes Augusta Gein look like the most frightening person on the planet. 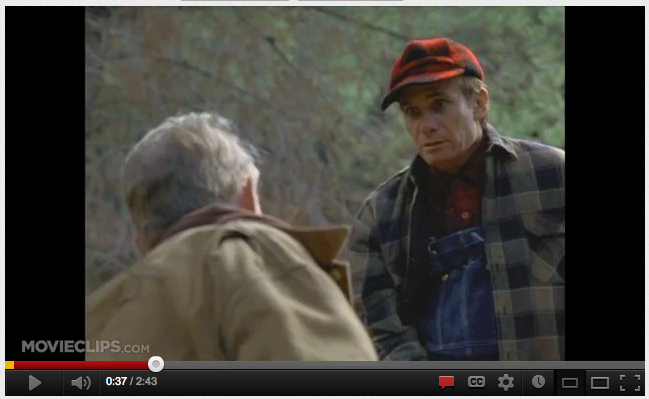 Steve Railsback's portrayal of Ed allows for the film's character study treatment of this bizarre human being in the purest sense of the word, with special emphasis on how he became such a depraved individual. The film also takes a position in the debate about Gein's mental state, namely that he knew his actions were wrong yet the voice of his mother he frequently heard in his mind overrode his inhibitions.